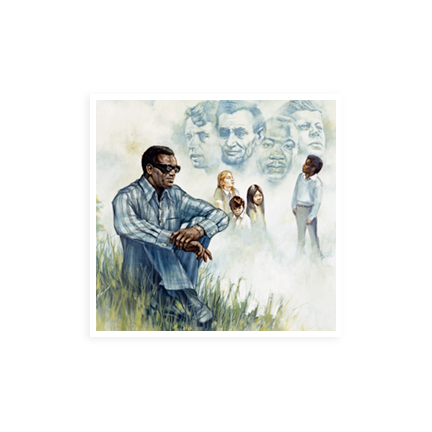 Ray Charles received many major awards, among them: “The Golden Plate Award” which was presented to him in 1975 by the American Academy of Achievement for his outstanding contributions. He was subsequently named to the Academy’s Board of Directors. 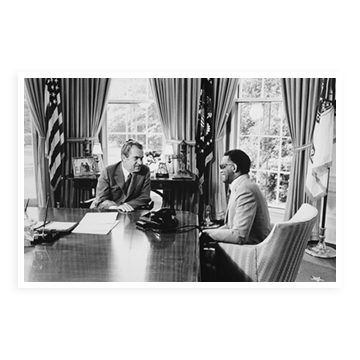 Ray Charles performed “America The Beautiful” for President Richard Nixon at the White House. 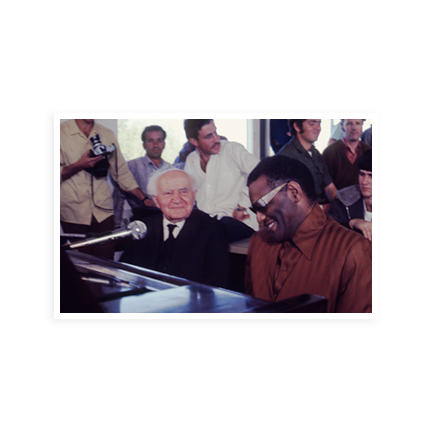 Ray Charles, while on a concert tour in Israel, had the opportunity to spend several hours with the Prime Minister, David Ben-Gurion. Mr. Charles presented him with the album Message to the People. His awareness of racial injustice was not limited to the home front. In the same years Mr. Charles fought the war against racial injustice in the American south, Charles became aware of growing racial injustice abroad, particularly the notorious policy of apartheid in South Africa. Modest to the point of mum about his humanitarian and charitable activities, Ray Charles made an exception for the State of Israel and world Jewry. 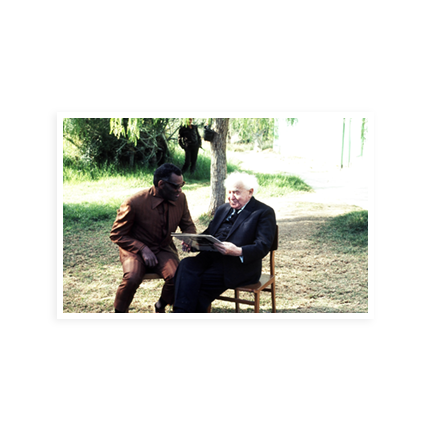 Among the many, the world leader Charles most enjoyed meeting was David Ben-Gurion, with whom he had a conversation of many hours during a concert tour of Israel not long before Ben-Gurion’s death. Among the hundreds of awards Mr. Charles received in his lifetime, the award he claimed to have touched him the most is the Beverly Hills Lodge of B’nai B’rith’s tribute to its “Man of the Year” in 1976. Ray Charles received a GRAMMY Nomination for Best Rhythm & Blues Vocal Performance Male for his “Living for the City” Single. The National Association of Sickle Cell Disease’s first “Man of Distinction Award” was presented to Ray Charles. He has shown a long and active concern and involvement with sickle cell disease programs, and was long time Honorary Chairman for the NASCD’s Los Angeles chapter since 1962. The Bicentennial Year brought the honor of Ray Charles being named “Man of the Year” by the Beverly Hills Lodge of the B’nai B’rith. 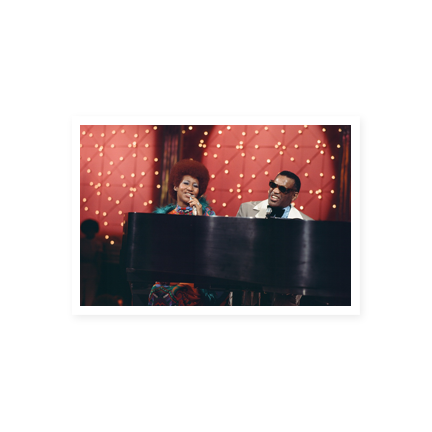 Ray Charles was inducted into the Songwriters Hall of Fame and his “I Got a Woman” was nominated for the National Academy of Recording Arts and Science Hall of Fame. 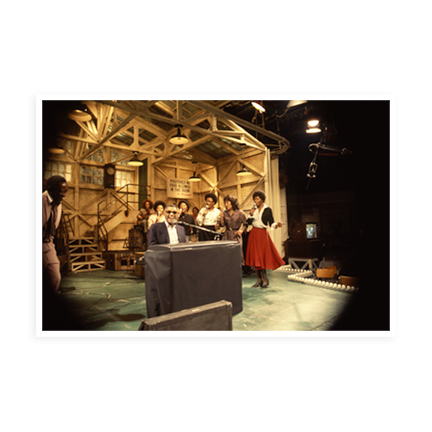 Ray Charles appeared as the host of NBC’s Saturday Night Live. 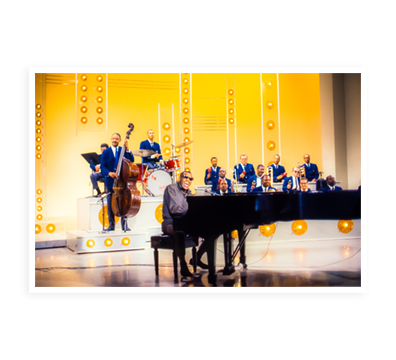 Dial Press published Ray Charles’ autobiography, Brother Ray, written with David Ritz. It was a national best seller as well as a book club selection and is also available in paperback. Ray Charles received a GRAMMY Nomination for Best Jazz Vocal Performance for his True To Life album. Ray Charles received a GRAMMY Nomination for Best Rhythm & Blues Vocal Performance Male for his “I Can See Clearly Now” Single. Ray Charles received a GRAMMY Nomination for Best Rhythm & Blues Vocal Performance Male for his “Some Enchanted Evening” Single. Ray Charles’ 1960 classic rendition of “Georgia On My Mind” was approved as the official Song of the State of Georgia, and Charles was invited to be present on the floor of the State Capitol to sing its first performance as such. The Ray Charles version of “Georgia On My Mind” is the first popular song to become an Official State Song at the Georgia State Assembly.